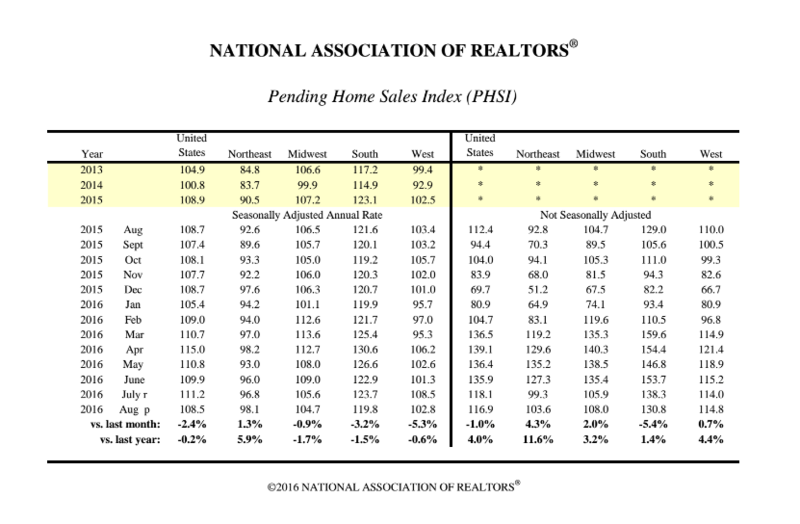 NAR's Pending Home Sales Index, which measures how any real estate contracts were signed in the given month (a forward-looking indicator), dropped for the third time in four months. Specifically, August's index reading declined 2.4 percent to 108.5 from a downwardly revised 111.2 in July. The spirited element of competition that arrives with football season isn’t quite the same when the stakes are higher (and extremely personal), as is the case with buying a house. Many real estate consumers are thinking the superfandom ends when the housing pickins’ are slim and the offers are fierce. What do pending home sales say about the housing market’s future? The PHSI, which measures how many real estate contracts were signed in the given month (a forward-looking indicator), dropped for the third time in four months. Specifically, August’s index reading declined 2.4 percent to 108.5 from a downwardly revised 111.2 in July. By comparison, August 2015’s index was 108.7 (a 0.2 percent difference), and this most recent reading reading represents the lowest PHSI since January 2016. NAR’s chief economist Lawrence Yun explains that only one U.S. region was able to provide buyers with a decent selection last month. “Contract activity slackened throughout the country in August except for in the Northeast, where higher inventory totals are giving home shoppers greater options and better success signing a contract,””he said in a press release. A number of market influencers illustrate a future where the housing recovery could potentially stall, according to Yun. For 15 consecutive months, inventory has fallen year-over-year; homes are staying on the market 11 days longer than they did at this time last year; and existing home prices have grown without abatement for 54 straight months. “There will be an expected seasonal decline in new listings in coming months, which could accelerate price appreciation and make finding an affordable home even more of a struggle for would-be buyers,” Yun said. Moreover, a study from NAR earlier this month showed a discrepancy between single-family home builds and the job creation rate, leaving 80 percent of the country’s metro areas lacking in available housing. “When combined with the scant supply levels for existing homes, these tight inventory conditions continue to hamper affordability in many of the largest cities in the country — especially those in the West,” the report noted.